Disclaimer: The views expressed in the article are that of the author's and do not necessarily reflect Sportskeeda's stand on the same. Tennis is a game where players' talent and their Tennis apparel is given equal importance. Over the years, the legendary game has seen lots of fashion depictions on the court. However, some tennis outfits turned out to be major on-court controversies. Great outfits are appreciated while the inappropriate ones become the talk of the year. The choice of every player is different and they try to opt for a unique outfit for every Grand Slam. The various Grand Slams too give them a number of rules to follow. Wimbledon is the oldest and most classic Grand Slam in tennis. It also has the most rules regarding the attire of players. Wimbledon expects players to come on grass courts in complete white outfits. This adds elegance and uniqueness to the Championship. Other three Grand Slams, the Australian Open, the French Open and the US Open allow all typical tennis outfits. In the history of tennis, there are badly dressed tennis players whose outfits are remembered until today. Some of the famous players too have made major flaws with their dressing on courts. Yet few players have gracefully displayed talent despite their bad dressing. Some still are infamous for their undesirable tennis apparel. All these instances have developed controversies over time. We can quote examples where players were even banned for creating on-court controversies with respect to their outfit. Some badly dressed tennis players also faced mocking comments from the audience on courts. Here are the 10 most controversial tennis outfits of all time. 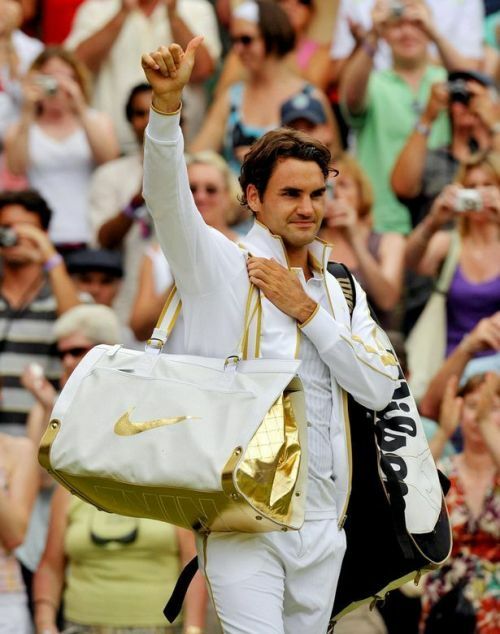 Federer walked in with a gold accented coat during Wimbledon in 2009. The shining strips on his tennis outfit and the golden lining on his coat looked quite inappropriate. His bag created extra buzz among his fans and the audience. The bag had a golden Tick representing his official Nike brand. The bag lacked its purpose on the Tennis field because of the large shimmering gold base.